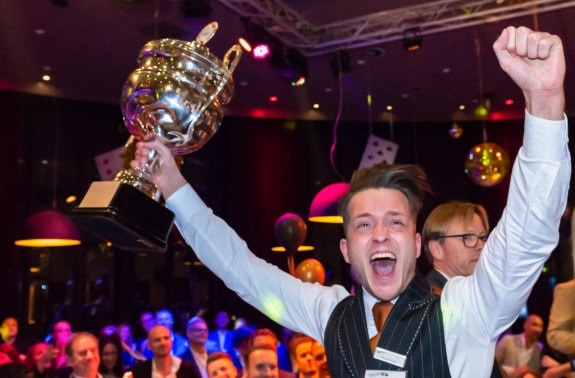 Jesse Jan Brinks won the Holland Casino Croupier of the Year title last Monday evening. The young Jesse Jan Brinks, from the brand new Holland Casino in Amsterdam West-Sloterdijk, defeated croupiers from Leeuwarden, Rotterdam and Venlo during a blistering final at Holland Casino Valkenburg on the evening of the 11th March. Jesse Jan represents the Netherlands and Holland Casino during the European championships in Tallinn (Estonia) from April 29 to May 1, 2019. During the final, the 15 croupiers from all over the Netherlands competed against each other at the Black Jack and American Roulette tables under the critical eye of the jury. The jury consisted of 16 experts from table games from all over the Netherlands who judged the croupiers on game leadership, numeracy, technical skills and hospitality, among other things. That was done by 4 jury members per table. After Erwin van Lambaart, CEO of Holland Casino, announced the 4 finalists, the final of the Croupier of the Year 2019 started. The croupiers Marije van den Berg (Leeuwarden), Maikel Gillessen (Venlo), Jesse Jan Brinks (Amsterdam West- Sloterdijk) and Ray de Rozario (Rotterdam) showed the jury members under great pressure why they excelled in the field of craftsmanship and hospitality. Jesse Jan Brinks from Holland Casino Amsterdam West-Sloterdijk became the winner and, jumping with happiness and surrounded by his supporters, received the trophy.